Pitched roofs require specialized equipment. The MetalBest Ultra-Temp 6 Inch Diameter Chimney Pipe Pitched Ceiling Support Kit - Stainless has everything you need to address every situation your pitched roof can throw at you. The kit includes a round top, a storm collar, a finish collar, a roof support package, an adjustable pitch ceiling plate (0/12 to 6/12), and a stove pipe adaptor. 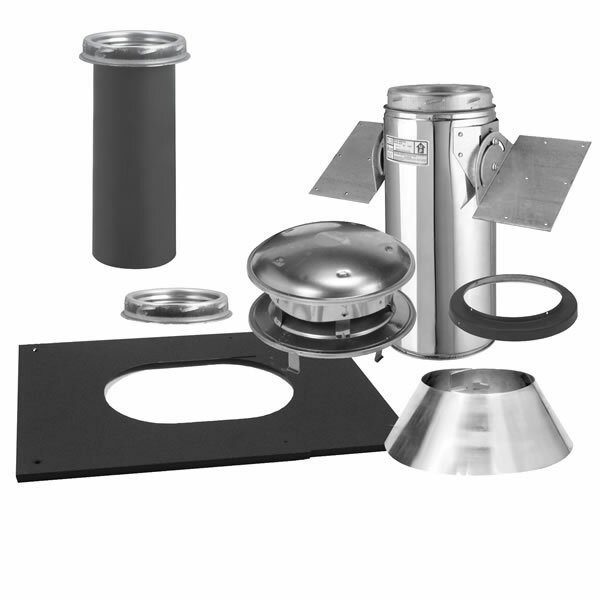 Roof problems are no problem when you include the MetalBest Ultra-Temp 6 Inch Diameter Chimney Pipe Pitched Ceiling Support Kit - Stainless in your chimney installation plans. Will this work on a non-metal roof? Yes, this will work on a standard roof. You will need to add the appropriate MetalBest 6" roof flashing and pipe lengths separately. I needed to put a stovepipe through a pitched ceiling and roof and this kit was perfect for the job. The instructions were clear and concise, and everything has functioned beautifully. I used this support kit on a previous pitched ceiling installation and have been quite pleased with it both times. The mounting brackets are made from rigid steel plate which attach tightly to the suspended chimney thimble and provide proper air space through framing. It was easy to secure and plumb the chimney. For shorter chimneys, I prefer this type of support over "boxes" which bear the weight of insulated pipe. It's a much easier installation and there's no "box" to accumulate debris during construction and over the years following. My only complaint is that the storm collar didn't fit tightly enough (to suit me) around the insulated pipe. Extra time and a pair of shears improved the fit considerably. ProsStainless steel insulated chimney is the best way to go. I ordered this kit online about 10 days before I was ready to install. It arrived promptly and in perfect condition. The pricing was honest and a fair bargain for what is contained. You need to add an exterior roof flashing but the kit was otherwise complete.